Cake pops are adorable, but each pop can pack in nearly a day’s worth of added sugar. For a healthier version, use this red velvet recipe adapted from QuestNutrition.com. 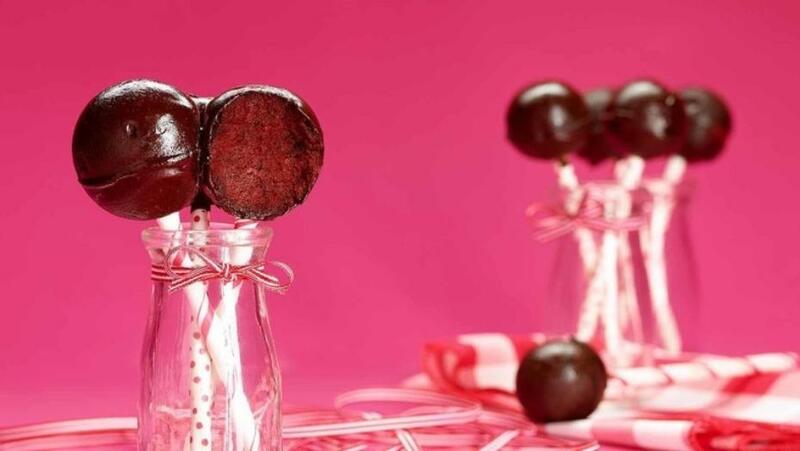 With 80 percent fewer carbs, triple the protein and quadruple the fiber compared to traditional cake pops, these are gluten-free and a perfect Valentine’s Day treat! Preheat oven to 350 degrees. In medium-size microwave-safe bowl, heat unwrapped Double Chocolate Chunk Quest Bar for 10 seconds. Using a rolling pin, roll bar out to 1⁄4-inch thickness. Place on a baking sheet lined with parchment and bake for four minutes, or until bar is lightly crisped. Remove and allow to cool. Break crisped bar into pieces, place in mini blender and process into powder. In a medium-size mixing bowl, add Quest Vanilla Milkshake Protein Powder, the powdered Double Chocolate Chunk Quest Bar, almond meal, cocoa powder, zero-calorie sweetener, baking soda and salt and mix well. Add almond milk, vanilla extract and natural red food coloring. Mix cake base until fully incorporated and batter is dark red. Coat 9-inch by 13-inch glass baking dish with nonstick cooking spray. Pour in batter. Bake 18 to 20 minutes or until an inserted toothpick comes out clean and cake is springy. Remove and allow to cool. Break cake into small pieces and place in a large mixing bowl. To assemble cake balls, remove cake from freezer. With your hands or a mini ice cream scoop, form 18 walnut-sized balls of cake. Place in refrigerator. Once chocolate is ready, remove cake balls from fridge. Insert cake pop sticks into the balls. Then, carefully submerge each ball into melted chocolate. Gently tap edge to remove excess. If chocolate begins to harden, simply return to double boiler to melt. Chill for 10 minutes in refrigerator, or until chocolate hardens and creates a shell. *To make frosting: In a medium-size bowl, add Quest Vanilla Milkshake Protein Powder, cream cheese, zero-calorie sweetener, sour cream and vanilla extract. Mix until smooth.